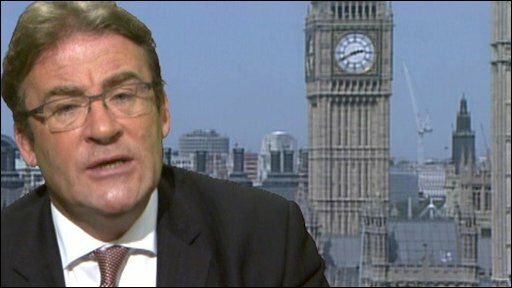 Employment Minister Tony McNulty admits the jobless figures are "very bad"
The number of people out of work in the UK rose 244,000 to 2.22 million in the first three months of 2009, the Office for National Statistics (ONS) said. The jobless rate rose from 6.7% to 7.1%. Unemployment benefit claimants in April rose 57,100 to 1.51 million. The quarterly rises in the jobless rate and number were the biggest since 1981. The figures were due to be released by the ONS at 0930 BST on Wednesday, but came out at 1400 on Tuesday after an "accidental early release". The ONS has launched an inquiry into how the early release happened. "The standout numbers are the big increase in the unemployment rate at 7.1%," said Brian Hilliard, chief UK economist at Societe Generale. Has the recession bottomed out? "We had been looking for 6.9% so that is a really sharp acceleration." In another sign of the severity of the economic slowdown, average earnings including bonuses were 0.4% lower in the first three months of 2009 than they had been in the same period of 2008. Average earnings had not fallen since records began in 1991. The ONS said it was "mainly due to lower bonuses in the financial sector". Excluding bonuses, average earnings grew by 3.0%, down 0.2% from the previous period. "The smaller than expected rise in the UK claimant count in April is good news, but the rest of the labour market figures are pretty awful," said Vicky Redwood from Capital Economics. There were 455,000 job vacancies in the first three months of the year, which was down 51,000 from the previous quarter and 232,000 less than the same period of 2008. "I fear that the unemployment rate... is certain to deteriorate much further. We're looking at figures of 10% around the turn of the year," Mr Hilliard said. The Employment Minister Tony McNulty conceded that the figures were "very bad", but took some comfort from the slowing rate of increase in the claimant count. "I'm not saying green shoots or anything like that by any means but I am saying that whilst we have not reached the bottom, the rate of decline appears to have slowed," he said. The number of people out of work has risen 592,000 in the past year. "Unemployment is the country's number one emergency and the government must use all possible means to address it," said Brendan Barber, general secretary of the TUC. "Some people in the City are already talking of recovery. But the only recovery in the real world will be when unemployment starts to fall."